We will pick you up from hotel with private air conditioned modern vehicle and drive to Hurghada airport then fly to Cairo. Meet in Cairo airport with your Egyptologist guide to visit the great pyramids of Giza, Sphinx and Chefren Valley temple. Get lunch in local restaurant then wander the Egyptian Museum, home of 160,000 antiques covering all historic ages of Egypt including the priceless collection of Tutankamun, finally stroll the streets of Khan El Khalili Bazaar. 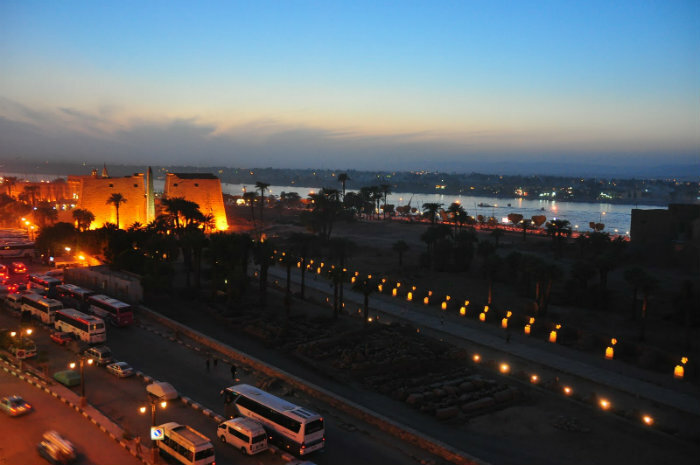 Evening transfer to Cairo airport to board the flight to Luxor where you will be welcomed and transferred to hotel and overnight. Breakfast in hotel then drive to relish the impressive temples of Karnak or the "Most Selected of Places" as named in ancient Egypt. It was the top cult place in the monumental city of Thebes devoted to the Theban Triad with Amun on its head. Get your lunch meal in local restaurant then cross the Nile River to the west Bank, Explore 3 or the 62 cut rock tombs in the famed Valley of Kings, wander Al Dier Al Bahary temple built by the powerful woman who ruled Egypt once for about 20 years in ancient times then stop to learn about the Colossi of Memnon. Evenig travel back to your hotel in Hurghada.